Looking for a new water purifier under 6000 or 8000 for your home? Take a look at our list of 10 best water purifiers under 6000 and 8000 in India. Rs. 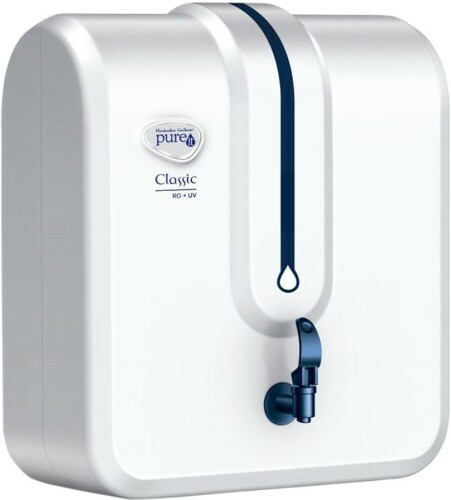 6000 is the starting price point of water purifiers from good brands. In this article, you will see that we have covered products from Kent, Pureit, Havells, Eureka Forbes, MarQ and few others. All these companies provide good value for money water purifiers and they have decent after sales service network as well. You will see that we have covered various types of water purifiers like UV, UV + UF, RO + UF, RO + UV + UF. Only UV purifier offers basic purification is suitable if you get low TDS water at your home and the RO + UV + UF offers best water purification and can be used for high TDS water. The purifiers are priced from around Rs. 6000 to around 8500. If you can spend a bit more, do take a look at the best water purifiers under 10k in India. Let's now take a look at best water purifiers under 6000 and 8000 in India. You will find a brief review of every purifier with its specifications, features and pros cons. 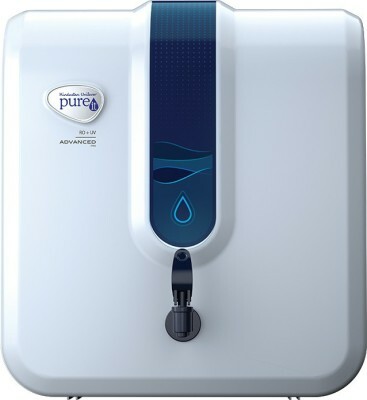 Eureka Forbes is a reputed brand in water purifier industry. This water purifier from Eureka Forbes is a UV Purification system which uses UV rays to kill bacteria, virus, and cysts. It does not use any chemicals so the water dispensed from it is safe to drink. If you are wondering how it works then here is a simple explanation: There is a carbon filter with UV Lamp inside the purifier. The water goes through the carbon filter and glass tube. The carbon filter keeps bacteria at bay with the help of activated carbon that has 0.2 percent impregnated silver. It also removes color, bad taste, chlorine, metals, and dissolved gases. Then the water goes through the glass tube where UV rays kill the bacteria, virus, and cysts. There is a Lamp Sensing Mechanism by which the purifier switches off the UV lamp automatically when not in use for 10 minutes. The Energy Save Mode saves electricity and increases the life of the lamp. The Aquasure water purifier is built on Quartz Glass Purification which means that water does not touch any metal during the purification process. It passes through a glass tube instead of a metal chamber. The Aquasure Smart UV water purifier has a high flow rate. It dispenses 2 liters of water every minute. Plus, this water purifier comes with a voltage stabilizer that protects it from fluctuating voltage levels and damage. The UV lamp also has a sensing mechanism which observers the functioning of the UV lamp and if there are any problems, it stops dispensing water. How to use it? Plug the water purifier into a power source and then you just need to place the glass in the holding trap and press the button. The cartridge life of Eureka Forbes Aquasure is around 6000 liters. Which means if you consume 15-20L of water every day, you will have to replace the cartridge after a year. 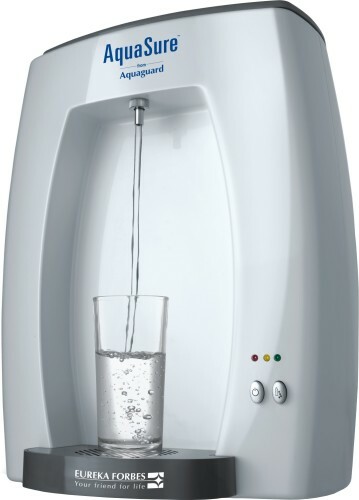 This Eureka Forbes Aquasure water purifier has a very good rating of 4.2 stars on Flipkart by almost 350 users. 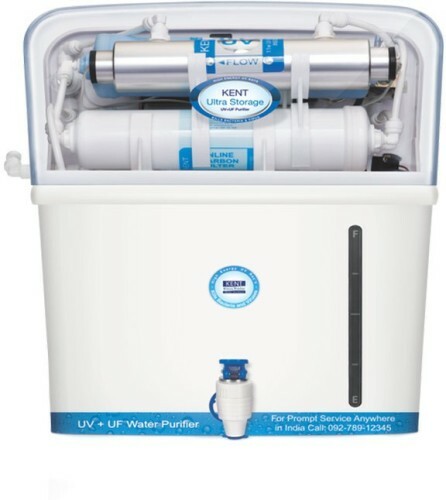 Under 7000, this is one of the best UV water purifiers available in India. 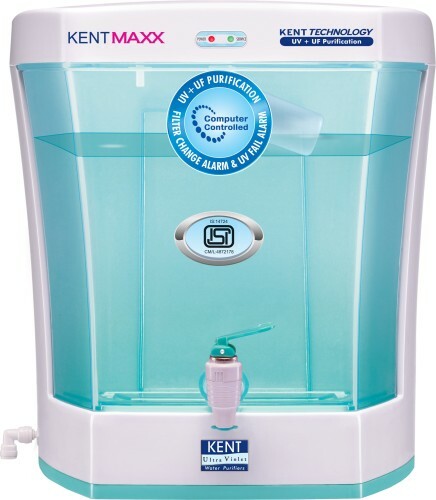 KENT Maxx is value for money water purifier with a storage tank of 7L capacity. The storage tank is detachable for easy cleaning. You can keep this water purifier on a table or mount it on a wall. The storage with water level tank makes the purifier visually appealing and an ideal tool for use at homes and offices. The storage tank is helpful as it ensures supply of clean water even in power cuts. It works on double purification method. The UF after UV removes dead bacteria, viruses and cysts from the fine pores of Hollow Fibre UF Membrane, thereby providing 100% pure, safe & tasty drinking water, which is ideal for consumption. Since KENT Maxx is based on UV and UF technology that does not remove dissolved impurities, it is suitable for use where inlet water has low TDS (Total Dissolved Solids). If you live in an area where TDS is high, you should not buy this water purifier. The Kent Maxx has a computer controlled operation which has two unique features – Filter Change Alarm and UV Fail Alarm. The time-based filter change alarm notifies the user to change filters and the UV fail alarm is for alerting the user when UV lamp becomes inefficient. In both the cases, power supply to the purifier is cut off, thereby ensuring that impure water is not delivered to the user. KENT Maxx uses high-powered 11W UV lamp instead of the standard 8W UV lamp which provides complete de-activation of harmful micro-organisms. The High-wattage lamp ensures better safety against harmful micro-organisms like bacteria and viruses. The operation of Kent Maxx is fully automatic. It will start automatically when the water level falls below a level and then switches off when the storage tank is full. This ensures trouble free operation without the need of manual intervention. KENT Maxx has a built-in rugged SMPS (Switching Mode power supply) instead of a power adaptor. It can handle a wide range of input AC voltage (100 – 300 Volts) which means voltage fluctuations won't impact this water purifier. If you have a budget of under 10000 and just need a UV+UF purifier then this is a good option. Livpure has a lot of options in water purifiers. The Liv Pep Pro/Glo Plus + water purifier which provides a 7 stage filtration process water purifier at a price of around/under 10000. There is another variant Pep Pro/Glo which is same as Pep Pro Plus minus the UV part and costs around 3000 less. Here we take a look at the Liv Pep Pro/Glo. The fifth stage is ultrafiltration cartridge. The ultrafiltration cartridge effectively removes bacteria, giardia, cysts, and other harmful pollutants from water. It also removes fine suspended impurities from water, to improve its clarity. This 5 stage filtration process is very effective and can convert water of TDS up to 1500 into a clean drinking water of TDS under 100. It can output around 12L of drinking water per hour. 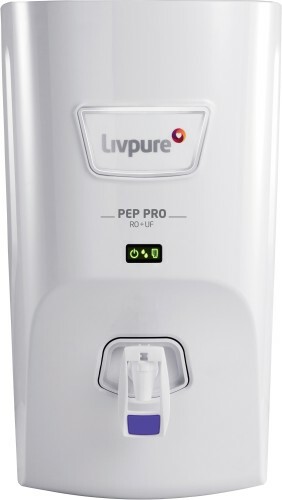 This Liv Pep Pro water purifier has a very strong build and comes with an automatic switch on/off process. It automatically switches off when water tank is full and starts when the level is low. There are indicators on the front to display whether the tank is full or not. Overall a very decent water purifier under 10k. Hindware Calisto is a 7 Litres water purifier which comes with 6 stages of RO + UV + UF purification filters. It has a stylish design with white color and looks elegant and has strong build quality. The filters have a life of around 6000 liters of water purification and the system can clean water with TDS level-up to 1800. With its purification, you get clean water free of salts and any microbes. Hindware is a big name in the industry and they have kept the trust with this purifier quality In total you get a sediment filter, pre-carbon filter, germ eliminator, post-carbon filter and so on. This purifier comes with a magnetic design with a detachable front cover making it easy to clean and servicing this purifier. The 3 smart LED indicators to add to the look of the purifier and indicate the current stage of purification is ongoing, completed and appliance on/off. The purifier has a warranty of 1 year on RO membrane and 6 months on all filters. It is one of the best selling water purifiers under 10000 in India. So that was our list of best water purifiers under 6000 and 8000 in India 2019. We hope the above list was helpful in finding out a suitable water purifier for your home. If you would like to see more options from Kent or Pureit, take a look at best Kent purifiers and best Pureit purifiers in India.